FORMAT / LOWER PRICES ! TOP 10-IN-A- ADVERTISING = WHAT A TEAM! 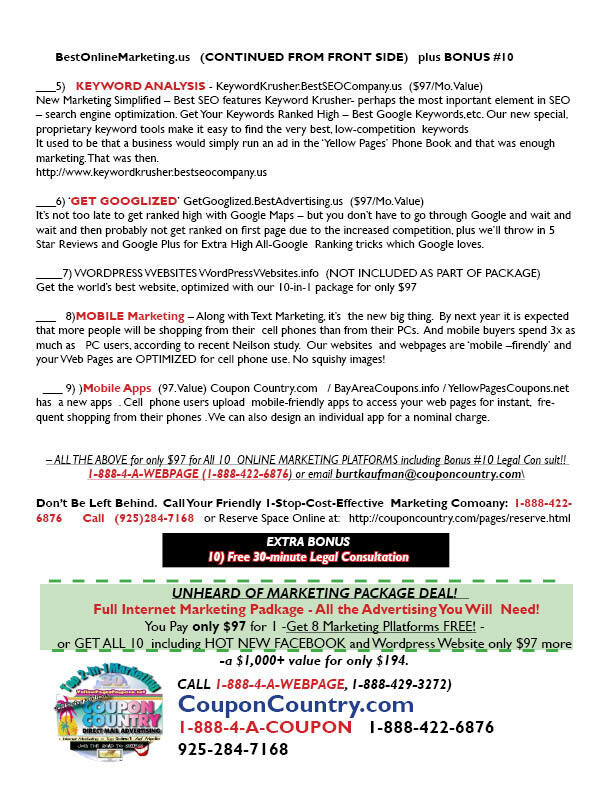 TOP 10-IN-1 MARKETING – 2013 MAILING SCHEDULE – -FREE WEB COUPON SITE and -FIRST PAGE GOOGLE! -FREE Full Color coupons-FREE Road to Success Famous 1913 Motivational Poster MOBILE COUPONS / APPS – Newest advertising platform FREE to Coupon Country advertisers! MobiQpons only coupon app available on all three leading smart phones – NOW FREE 3 months! Greetings 2013!! We are a localsmall business like you whose ownerwill personally show you the latest, bestand , in our case, LOW COST , TOP 2 RATED MARKETING CAMPAIGNS. For a fraction of what others are charging to optimize your web site, we will do a 10,000 mailing for you as well as a FIRST PAGE SEARCH COUPON WEBSITE . We have spent much of last year and this year studying and implementing SEO (Search Engine Optimization) in our attempt to stay ‘ahead of the curve’ as the internet becomes a major presence. YellowPagesCoupons.net & BayAreaCoupons.info sites are already bringing significant visitors to many of our advertisers. . So,stay with The ROAD TO SUCCESS, our new theme. Ask for our infamous Poster which got it all started 30 Years ago! Here’s wishing you Good HEALTH and Much WEALTH this year! Call now for mailings and internet coming soon to your area! 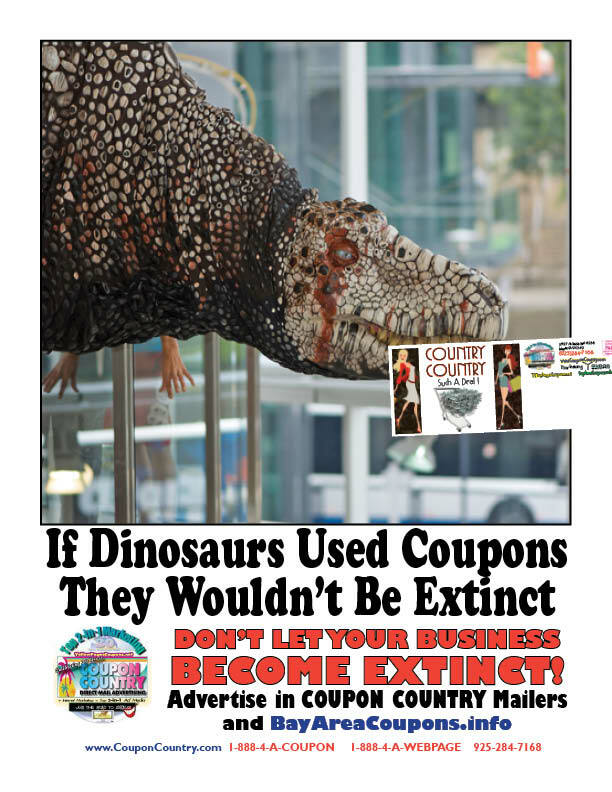 Call Burt Today – Get Business Tomoorw or email us at burtkaufman@couponcountry.com MOBILE COUPONS – are becoming the next big marketing platform and Coupon Country has teamed up with a leading mobile coupon company,MobiQpons, to make mobile coupons/apps now available FREE for 3 months(!) to current Coupon Country advertisers/ MobiQpons is the only mobile coupon company available on ALL THREE TOP APPS – IPHONE, BLACKBERRY , GOOGLE ANDROID Smart Phones. Blast the competition with our new FACEBOOK APPS! Some call Facebook and Twitter the ‘new email’. It used to be that a business would simply run an ad in the ‘Yellow Pages’ Phone Book and that was enough marketing. That was then. Is Your Website Optimized? Learn the difference between computer optimization and SEO optimization including our cost-effective 6-in-1 Online Marketing Package. Boost Business 30% with 7-in-1 Online marketing package featuring Email Blasts Text Marketing plus Top-Rated Offline DIRECT MAIL COUPON MARKETING (Coupon Country) ! 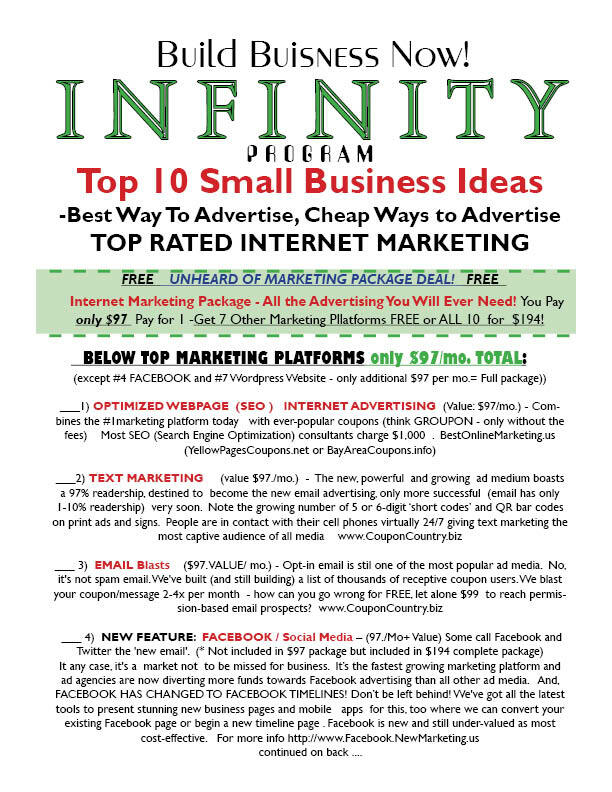 In its 2010 study, we learned that Internet Marketing has replaced the old, traditional print (newspaper and phone book ) along with broadcast TV and radio , as the top ad media of choice by business and consumer alike – and more cost-effective (Ad-ology), with direct mail a close second. . Now , within the top-ranked INTERNET, Ad-ology has broken down the internet by category, showing email marketing still leads the way, along with website development (SEO) and mobile marketing coming on strong. Coupon Country and YellowPagesCoupons.net feature these top marketing platforms at unbelievably low rates 1-888-422-6876. Additionally, the forever optimistic small-business community expects more sales this year (more than 56.2 percent). Simultaneously, they seem to see some relatively untapped, cost-effective digital options like online videos, as well as increased mobile advertising, as viable marketing options this year. 45 percent of businesses plan to use online video in their marketing in 2011, vs. 28.4 percent in 2010. 35.9 percent of small businesses surveyed plan to use mobile advertising in 2011, vs. 21.3 percent in 2010.